The Consolidated Omnibus Budget Reconciliation Act (COBRA) gives workers and their families who lose their health benefits the right to choose to continue group health benefits provided by their group health plan for limited periods of time under certain circumstances such as voluntary or involuntary job loss, reduction in the hours worked, transition between jobs, death, divorce, and other life events. Qualified individuals may be required to pay the entire premium for coverage up to 102 percent of the cost to the plan. 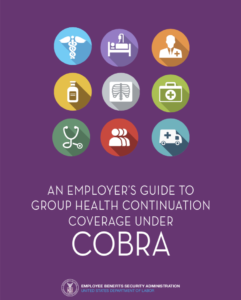 COBRA outlines how employees and family members may elect continuation coverage. It also requires employers and plans to provide notice. Provides information and guidance for premium reductions and additional election opportunities for health benefits under the ARRA. Provides information on bankruptcy’s effect on pension and group health plans. The Employee Benefits Security Administration (EBSA)provides many forms of compliance assistance, including voluntary compliance programs, advisory opinions, and publications. They are compiled on EBSA’s Compliance Assistance web page. This compilation includes information specifically developed to assist and inform employers and employee benefit plan practitioners in understanding and complying with the requirements of the Employee Retirement Income Security Act (ERISA)as they apply to the administration of retirement plans. Much of the material is specific and technical in nature. It is not intended to be the only source of information necessary for employer-sponsored employee benefits plans to be in compliance. Employers and plan practitioners may also benefit by reviewing some of the more general materials available to the public at EBSA’s Consumer Information on Health PlansWeb page. Provides a description of the program that reduces the monetary penalties for employee benefit plan administrators with respect to plan filings to encourage voluntary compliance. The voluntary compliance program is intended to encourage self-correction of certain violations of ERISA and to protect the financial security of retirement plans. This fact sheet describes the process for making an application, the specific financial transactions covered, acceptable methods for correcting violations, and examples of potential violations and corrective actions. The EFAST system streamlines filing and processing of the annual return/report forms through the use of computer scannable forms and electronic filing technologies. This Web site provides assistance on using this system.